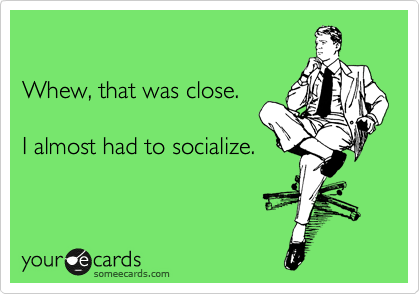 Being an introvert in the professional world is hard – like really hard. When I got my degree in accounting I expected to find a job where I’d work in a cubicle somewhere crunching numbers all day, debits and credits being my only friends. To my surprise, public accounting required constant communication with clients, managers, and coworkers. Deep fear and dread would consume me whenever I had to call a client and I would be exhausted after team meetings. Introverts know this all too well and face these challenges on a daily basis. Being an introvert in an extrovert’s world automatically puts you at a disadvantage. There is an expectation by employers that candidates applying for a job must have strong verbal communication skills. Even if you happen to fake your way through the interview, your cover will soon be blown – gasp! People will soon make comments about your quietness and introversion which only exacerbates the situation. “Why are you so quite?” – Why are you so loud? “Is everything ok? You’re pretty quite today” – I’m quite everyday. “Don’t worry, we’ll get you out of your shell” – Touch my shell and you die. “You should talk more” – You should talk less. But does being an introvert automatically disqualify you from business or professional success? Does hating small talk mean you’ll never land that big client or that promotion you’ve always dreamt about? Do I really want to talk to anyone today? The answer to all of these questions is an absolute and definitive NO! This article will detail how an introvert can be successful in an extrovert’s world. What if I told you being an introvert actually puts you at an advantage? What if you didn’t have to fake being an extrovert to get ahead? Following these simple steps will ensure an introvert’s success in a world where people won’t stop talking. The first steps to recovery is acceptance – acceptance of the fact that being an introvert is totally OK! Stop idolizing extroverts and start idolizing introverts. Would you look at this guy. Creator of Facebook, multi-billionaire, oh and not to mention introvert. He literally created the platform that everyone uses to socialize and revolutionized what it means to be social in the 21st century. Who else is an introvert? Just one of the most well know authors of the 21st century. The same introvert that got everyone talking about her hit series Harry Potter. The same introvert who used her skills in writing to claim the top spot as the world’s richest author. Did JK Rowling need to be an extrovert to be successful? Nope, she just let her stories do the talking. Think you need to be extroverted to be the leader of the free world? Think again! Barack Obama, the 44th president of the United States is considered one of the most successful introverts of this decade. Although he might seem more extroverted than the typical introvert, Obama is listed as being an introvert; a noticeable difference from other extroverted presidents like Bill Clinton. Take a look at one of the world’s richest men, Warren Buffet; an introvert. Buffet learned to overcome his fear of public speaking when he was young by signing up for Dale Carnegie’s “How to Win Friends and Influence People” course of seminars. Being one the world’s richest men is difficult, but you don’t need to be an extrovert to achieve that accomplishment. If you are particularly weak at holding conversations at networking events, making a compelling speech, or nailing a sales pitch, then your best bet is to ignore your weaknesses and instead focus on your strengths. It has never been a better time to be an introvert in business. Some of the top founders of billion dollar companies are introverts. Why? Because the age of the internet has allowed introverts to sit behind a computer and collaborate with people around the world. No more cold calls, no more door to door salesmen. Simply put some compelling content online on why your product is the best and presto, you have yourself a virtual business. Forcing an introvert to go to networking events, making cold calls, or knocking on doors is simply unnecessary and will yield negative results. You don’t have to be the biggest personality in the room to be successful, and convincing an introvert to try to be something they are not is a big mistake. If writing is your specialty then start a blog and produce written content to convince people to do business with you. People are searching Google everyday looking for ways to reduce their taxes, improve their bottom line, or even find the best wine to go with a steak (it’s a Bordeaux by the way). If you have the voice of a radio DJ but giving live presentations isn’t your style, than start a podcast. There has been a resurgence in podcasts and many people have built their personal brands around this platform. Talk about your industry whether it be real estate or investment banking. There are people out there who want to hear your voice and learn from your expertise. If you do well in front of a camera then make a vlog. People love videos and creating compelling content online could be huge for your product or service. The best thing about video blogging for introverts is that you can edit out all the bad stuff and keep the most compelling content in your final video. Almost half of the population is self-proclaimed introverts or some variation on the spectrum between introversion and extroversion. Chances are many of these people don’t want to go to networking events at all. However, LinkedIn has become a huge platform for people who want to network but don’t want face to face interaction. There are several forms of communication and limiting them down to in person meetings or impromptu phone calls does a disservice to your business or profession. There are millions of people who buy goods or services online, follow the advice of people they never met before, or listen to music from someone who lives half way around the world. Heck, there are 40 million Americans using online dating according to eHarmony. So if Americans are willing to find love online don’t you think they’d be willing to network online as well? So, if you’re an introvert who feels they are too quite to get ahead then start getting loud in other ways. Begin by researching famous introverts to reassure you that introversion is not a stumbling block to success. Secondly, forget about your weaknesses and ignore people who tell you that only extroverts get ahead in business and in life. Thirdly, leverage your strengths and focus on what you’re good at. Lastly, create a LinkedIn and follow me for more nonsense and ramblings of a self-proclaimed introvert.